Published on July 10, 2008 in Tweet Old Posts. 340 Commentshttp%3A%2F%2Ftrainfortopdollar.com%2F5-killer-tips-on-how-to-create-your-online-personal-training-website.htmlPodcast+Episode+%231%3A+5+Killer+Tips+on+How+To+Create+Your+Online+Personal+Training+Website2008-07-10+18%3A14%3A12Ben+Greenfieldhttp%3A%2F%2Fwww.trainfortopdollar.com%2Ftrainfortopdollar%2F%3Fp%3D34 Tags: how-to, online, personal, tips, training, website. In the past, I’ve personally done full graphic design and coding for twelve of my own websites. I’ve also had local community graphic web designers create two additional websites. But now, I outsource all this time-consuming work to Pakistan, India, or some other very inexpensive technology sector based geographical area. I talk comprehensively about this type of outsourcing in Chapter 5 of Train For Top Dollar. So what methods have I used to create my websites? Whoever you use to host your website will typically come include free web templates. What this means is that you can download the template to your computer, or you can use an online editing program that is usually available on your web host, and most of the work is done for you. For multiple reasons included in my book, especially for utilizing one-click, simple blog creation, my favorite host is Bluehost. The colors, backgrounds, and organization in these templates are already present, and you just drag and drop your desired pictures and text. This can be a very effective and quick way to design your website. On the flipside, a template will have a very generic feel, and you have extremely limited control over the basic website design and organization. These type of sites have no wow factor, but if you’re on a time crunch, have a limited budget, or just want to get started, this may be the way to go. If you use an online website design tool, typically also available from your hosting service (like Bluehost), you’ll finish a web page on your web site, then just press “publish” or “save”, and it now appears when people type your domain name (aka URL) into their computer’s web browser. If you use your own website design software, based from your computer, you typically have to create the website on your computer, then send it electronically (called FTP) to your hosting service, which typically provides pretty good instructions in the help section on how to use various web design software to create and upload your site. My favorite computer based software is Adobe GoLive, but if you go to http://www.download.com or http://www.tucows.com, you can download any number of free website design software packages. • Keep it simple and clean. Include lots of “white space” so your readers don’t become confused with 18 different training advertisements, fitness pop-ups, and sounds or music when they first visit your page. • Use photos effectively. Try to include your face or body if possible, to build a trust relationship with your potential online clients and show that you are indeed fit. • Use a simple navigation menu without too many buttons. A simple “Home”, “Services”, “About Us”, and “Contact Us” will suffice for a basic online personal training page. • Include space for publishing your latest breaking articles on your home page. This is very important for search engine optimization, which I present later in this chapter. The people I coach and train are my main focus in life. When you reach your goals, I feel I’ve contributed to your life in a unique way, and somehow contributed my knowledge to help you achieve something special and meaningful. I’m in the process of updating my website – specifically the online fitness and nutritional training services. I really want people to know how I can help them achieve their desires. Here’s where you come in. If you’re interested, I’m looking for testimonials. Just a brief sentence or paragraph about how I’ve helped you identify objectives, reach your goals or simply supplied you with a nudge in the right direction. If I use your testimonial on my website or in a brochure, I would just write your first name, or simply your initials if you’d prefer. All you really have to do is shoot your testimonial to me via e-mail. Thanks for considering, and remember to train and eat smart! That oughta get you started. 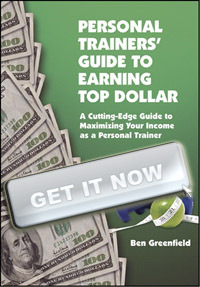 I offer business and website consulting services to personal trainers, and give a ton of information in my book Train For Top Dollar on how to make six figures as a fitness professional. Check it out here.